New Arizona Law: Guns From Buybacks Can't Be Destroyed : The Two-Way Gov. Jan Brewer signed the legislation requiring weapons collected in buyback programs to be re-sold. She also signed a separate bill that bars local governments from keeping lists of people who possess firearms. Detective Enrique Chavez logs weapons from a gun buyback in Miami. 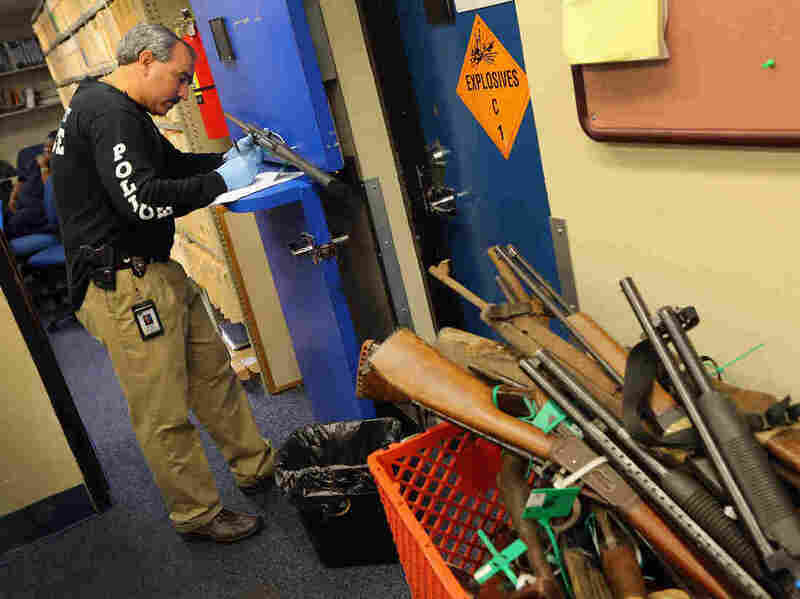 Arizona's new law requires municipalities to re-sell weapons recovered in such programs. Cities in Arizona that conduct buyback programs to get guns off the street will now be required to re-sell those weapons, according to a new law signed by the governor. Gov. Jan Brewer signed the legislation late Monday "preventing local governments from melting down the weapons obtained from these popular civic events. Before the new law, the state had allowed such firearms to be destroyed," according to Reuters. "The bill had the support of the National Rifle Association and Arizona's Republican-controlled legislature. It cleared the state Senate earlier this month by an 18-12 vote. The state House approved the bill in March. Supporters of the measure said municipalities were wasting taxpayers' money by not realizing the revenue from reselling turned-in weapons. Opponents argued that it sent the wrong message and that the state needed to focus on the broader issue of gun control." "Brewer separately signed another bill Monday which spells out that local governments are strictly prohibited from keeping lists of those who own or otherwise possess firearms. That expands on existing statutes which say cities cannot track buyers, sellers or others who transfer a gun. At this point, there is no evidence any city is keeping such a list. But proponents said they want to be sure that government never gets a chance to compile one." As we reported in January, while gun buybacks have proved popular with municipalities, especially in the wake of December's Newtown, Conn., school shooting, the efficacy of those programs has been questioned.